This post will conclude our virtual visit to Historic Natchitoches, Louisiana…for now. Hopefully you have found yourself captivated by the charm and beauty of this unique Southern gem and will add it to your travel agenda—or at least to your bucket list! 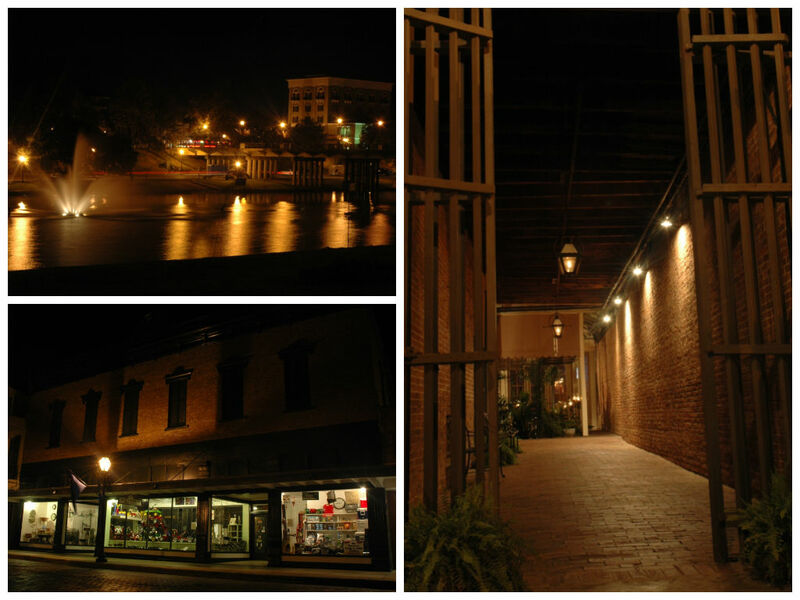 These photos were taken on a warm, summer evening several years ago, but little has changed and the same scene would greet you if you were to arrive in Natchitoches tonight! The 33-block National Historic Landmark District of Natchitoches is jam-packed with things to see and do. Once you have strolled down Front Street, checked out the Roque House and Beau Jardin, and rambled along the banks of Cane River, it is time to branch out and see the sights a street or two over. One way to gain an overall bird’s-eye view of the area is to hop aboard a trolley or climb into a horse-drawn buggy for a tour. Personally, I prefer sightseeing on foot so that I can go at my own pace—stopping to snap a photograph or popping into the corner coffee shop for a caramel macchiato whenever I feel the urge. Regardless of which option you choose, you will be treated to a feast for the eyes–beautifully restored homes, meticulously manicured lawns, stately live oaks, gracious magnolias, and classic buildings rich with history and character. In this limited space I will showcase a small sampling of interesting sights that can be found in close proximity to Front Street. To download a Walking Map of the Downtown Historical District, visit http://www.downtownnatchitoches.com/walking-map. This fountain is situated in the middle of beautiful Cane River Lake where it flows through Historic downtown Natchitoches. Having grown up mere steps from the banks of scenic Cane River Lake, I feel a kinship with the 35-mile long oxbow-shaped waterway. It meanders past the downtown historic district, creating a unique focal point that sets the city apart from all others in charm and appeal. At the founding of Natchitoches in 1714, Cane River Lake was indeed a river–part of the Red River to be specific. Sometime during the early 1800s, the temperamental Red forged a new channel across a bend about four miles upstream at Grand Ecore. Suddenly, Natchitoches found itself cut off from the main river channel; steamboat access became sporadic at first and then an impossibility. Within the last century or so, dams were built at either end of what is now Cane River Lake, separating it completely from Red River. 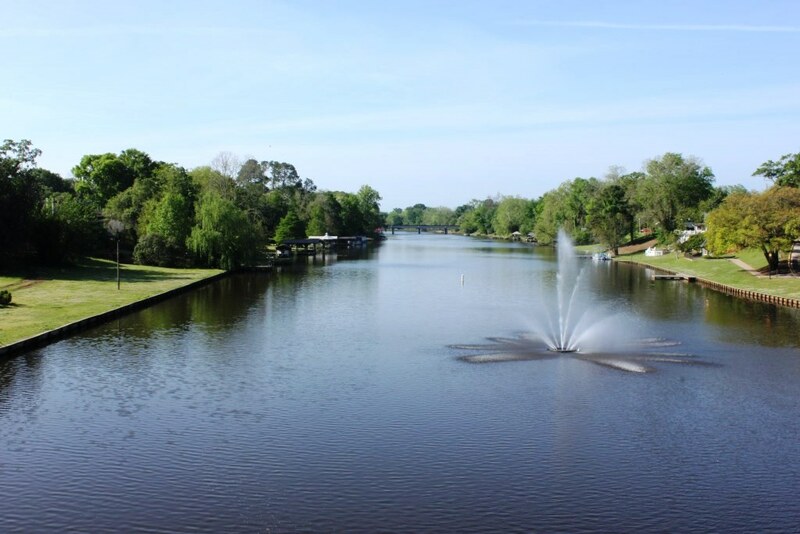 Though no longer technically a river, the lake possesses characteristics of a stream and “flows” through Natchitoches, effectively slicing the town in half. Residents and visitors alike appreciate the river’s recreational possibilities…boats and barges can be seen along its length most any day as folks enjoy fishing, skiing, or just tooling along taking in the scenery. The river is regulated and maintained by the Cane River Waterway Commission. For more information, visit its web site at http://www.caneriverwaterway.com/default.aspx. It’s true what they say—you can never go back. You can visit, however, and that is exactly what I did over the weekend. I made a quick trip to my hometown of Natchitoches, Louisiana and spent several hours luxuriating in nostalgia. I took a leisurely stroll through its iconic historic district…passing over the same bricks that have paved Front Street since the early 20th century; ambling along the banks of the beautiful Cane River (which is actually a lake, not a river); gazing into shop windows, temptingly bedecked, within the revitalized shopping corridor. I reveled in the opportunity to savor sights and sounds that were familiar, yet somehow new and different. It has been more than twenty years since I moved away and many things have changed. Happily, the changes appear to be favorable ones–improvements that have breathed fresh life into a city that just as easily could have gone the way of so many of its contemporaries–crumbling into insignificant oblivion. You may recognize Natchitoches as the setting for Steel Magnolias–the cinematic remake of Robert Harling’s off-Broadway play by the same name. (Incidentally, Harling is himself a Natchitoches native.) This quintessential Southern town has enough charm to win over the dourest of visitors, and offers plenty to do—both in the downtown area and beyond. 2014 is the three hundredth anniversary of the founding of Natchitoches and many special Tri-Centennial activities have been planned. (Visit http://www.natchitoches.com/tricentennial for more information about the celebration.) I have decided to focus on Natchitoches for the rest of the week, and will do my best to provide appealing imagery, cogent tourist information, and useful links and resources. 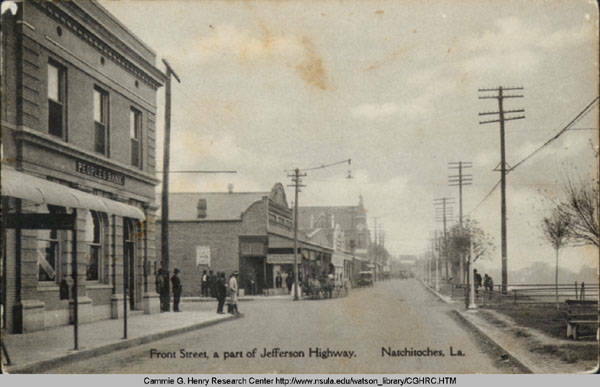 Welcome to your virtual tour of Natchitoches…Day One, Front Street! See my Visiting Natchitoches, Louisiana page under the Travel Tips and Talk link on the homepage menu.